The ever cheerful Pillsbury Doughboy is in mourning. Former ad man Rudolph Perz who created the giggly character, has died. Perz's slightly flaky creation known as Poppin' Fresh has survived for 50 years with his chef's cap tilted and his scarf neatly knotted at his throat. Perz's death was confirmed Thursday on General Mills (GIS)' website. He died on April 1 and was 89. 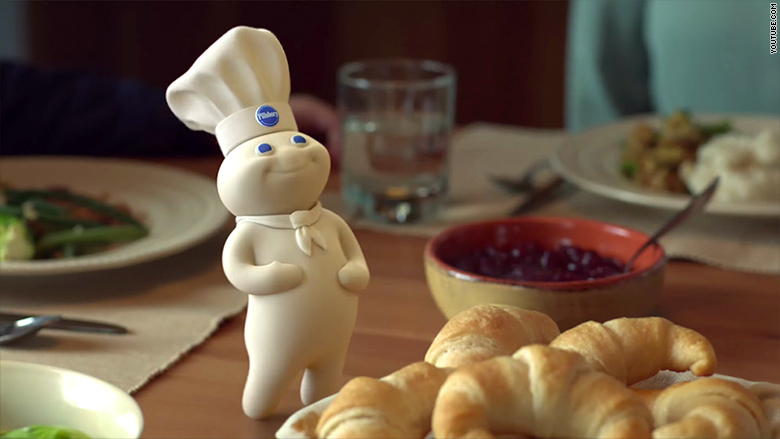 Perz was working on the Pillsbury account for the Leo Burnett ad agency in Chicago in 1965 when he came up with the crescent roll spokes-boy. The slightly chubby pastry boy quickly became one of the most recognized ad icons in the country. He spawned toys and became a regular in the Macy's Thanksgiving Day Parade line-up of balloons. In 1987 the doughboy was declared "America's most-loved character," according to ADWEEK . The first television commercial featuring Poppin' Fresh cost $16,000 to make and required five bodies and 15 heads for the stop action film, according to the General Mills website. In the ad, he introduced himself to the world with the now famous, "Hi! I'm Poppin' Fresh, the Pillsbury Doughboy." His voice was originally created by actor Paul Frees. Over the years, the Doughboy became more active, singing opera, riding a skateboard, helping in the kitchen and playing musical instruments. He recently was given his first pair of pants, a tiny pair of jeans. The Doughboy and Perz's work to bring him to life are scheduled to be part of an exhibit next month at the Chicago Museum of Broadcast Communications honoring "advertising's greatest icons." Other honorees include Tony the Tiger, the Jolly Green Giant, Morris the cat, Mr. Clean and Ronald McDonald.